I reside in the middle of the USA, in the High Plains of western Nebraska (almost 4000 elevation), where we have had minus 36 degrees F. in January a few years ago. This was taken last week and was the same temp the previous week as well - kinda scarey to be so warm this time of year. Above is the kind of mess one has when machine quilting a large quilt on a domestic sewing machine. Notice the crooked pictures, the blinds are mashed against the window, and my boxes of other projects on the sewing table surface are all askew. I had to be careful that I didn't quilt loose bits of Orca Bay into the back of this quilt, "Steps", another Rebuilt Log Cabin. The second light source is necessary to see stitches behind the machine. Do you see the large clip at the top of the photo? The clip holds final instructions for an Arabic Lattice (John Flynn) hanging on the valance. I was sure the project would be finished 2 years ago. Oh my, that really IS a UFO. The setting of the blocks are unusual and confusing, so I made sure directions were right in front of my face -- but 2 years ago??? Below is my current project (between Orca Bay construction), a Rebuilt Log Cabin called "Steps". It's nearly finished and I'm working on coming up with a quilting design in the last border, 9 inches wide. The book is from PatsyThompsonDesigns.com, and her suggestion is hyperquilted. In this case, the extra color and lines are not needed but I sure like the thread lines. I use a Flexicurve, a long version, to help me "see" what the plan will look like. I'll chalk in the implied spine, will start at the left (bottom) and work up to the top corner. I do agree with you about the weather this year. I'm in North Central Ks and just last week we were watching at least a half dozen robins and that many goldfinches at our feeders. That's NOT normal! Thanks for showing your quilting process on "Steps". Looking forward to seeing it finished. I'm also working on Orca Bay and almost ready to start setting the blocks together. Love this mystery. I read that the big earthquake in Japan last year moved the earth's axis ever so slightly. I wonder if our crazy weather could be caused by that. You do such great quilting on your DSM. What I need to do is throw a practice piece on my Premier and start working on feathers and other freehand designs. Just hate to take the time from "real" quilting, I guess. You do such incredible quilting on that Janome 6500P. I want to be a bird on your shoulder watching you! When we take a picture we see everything that's wrong, or needs doing, but is invisible to the casual observer. I love the work that you are doing on Steps. Take breaks often! I am so glad to see exactly how a large quilt looks like being quilted on a DSM. I just get nauseated when I think about quilting anything over crib size because working with all that much quilt is really daunting. I've had quite a few machine quilting classes, but they deal with the actual quilting, not how to maneuver the actual quilt around. Thanks for showing that! It's not an exact science, huh? Progress is progress and some projects have to sit and marinate before they can be finished you know. Liking what you have done so far. 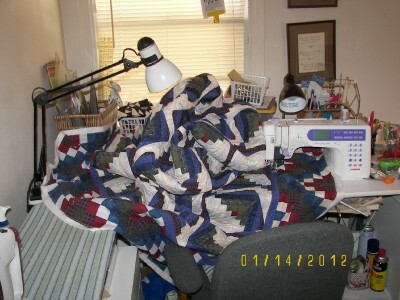 Oh I can so relate to the mess it is to fmq a large quilt on your domestic sewingmachine. I have recently been given a frame that will work with my dsm from my dear husband. But have I had time to try it out yet? Too many things going on but one day I will set it up in my rearranged sewingroom and hopefully that bundled up mess of quilt will be history. Thanks for showing your quilting in progress. It helps to see the "nitty gritty" part of machine quilting on a DSM. I love to do machine quilting, but my hands are not as strong as they once were and I have trouble manuvering the quilt around the needle. You are an inspiration. oh boy did I have to laugh....I too have not finished the John Flynn, quilt I started....maybe we could work on that on a sew day???? Looking good my "wise ole E"
Things look good to me. lol. We are our own worst critics...eh? Your LC is so wonderful. I like the Flexcurve it is a very handy tool. Keep us posted on your progress and let us know how it goes, k? Would love to see your finished quilt. Your work is amazing. Just to let you know, but your warm weather won't last. Our snow is probably headed your way! It has been a wierd winter this year. Thanks for the MQ photos. I can't do big quilts anymore, but I used to. It's quite a wrestling match, and anything in the way gets creamed! I only do smaller quilts now - arthritis isn't my friend. 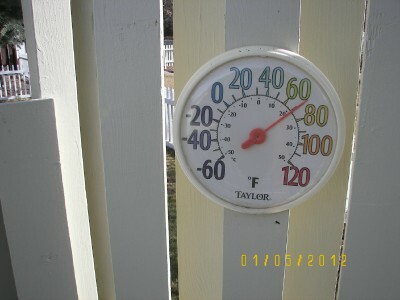 Wow, you have been warm! 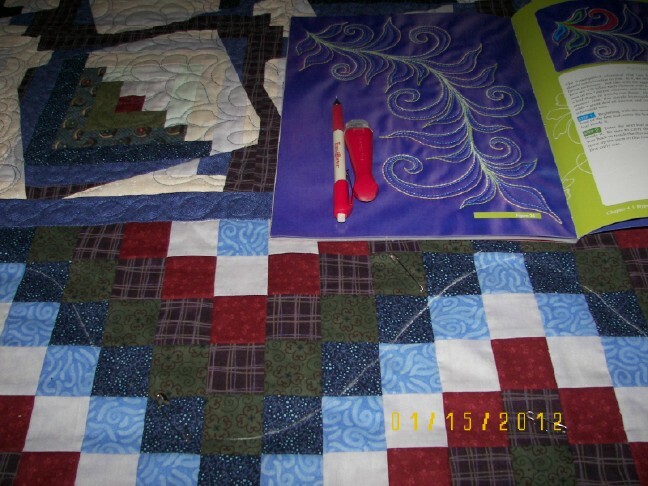 I have not attempted to quilt anything that big on my DSM. I appreciate seeing the work in progress. I hear about not rolling up the quilt, but couldn't quite envision what you do with it all. Now I know! You go girl... and just as a clean desk is the sign of a deranged mind, then a clean sewing room has to be the sign of something, maybe a quilter who never gets any work done! Brilliant. That something so simple can become so complex and interesting in our quilters hands. I admire anyone that does quilting of a big quilt on a domestic machine. I struggle with it every time and the air is sometimes blue! Do you baste down the outside border edges before you start quilting? I always had a problem with the outside edges raveling as I wrestled the quilt through the machine so I now baste the edges. I still get a bit of raveling but I can live with it. Does anyone do something different than this. To Anonymous (I'm unable to respond to your e-mail) -- I trim MOST of the "extra" off the outside borders to eliminate what I can, and yes, I might baste the edge. However, usually I have already machine basted the outer edge of the quilt TOP, especially if the border has been pieced, to take care of that raveling issue. Some people pull the extra backing over to the front to protect that edge, but to me, that just adds MORE bulk. One time I machine basted the entire quilt with gigantic water soluble thread stitches - that was a good exercise, although the light thread of the soluble got confusing with the light quilting thread. But it held everything nice and stable. Just a thought. Then I spritzed it afterwards, dissolving the water soluble thread. It WAS an interesting method. Some DSM quilter wannabes, think the big machine will take care of the quilting problems - I don't think so - you have to practice with whateer method you use. Frankly, overall, I think it's easier for me on a DSM, given all the options. Yes, I have done the fold over method too...usually when I'm too lazy to baste! About your idea of machine basting the outer edge of the quilt top...that is what I meant but my wording was confusing...sorry. Orca Bay, Progress - "Nearly 4000"